After arriving in the Colombian second largest desert later in the morning, we were dropped off in front of our accommodation, we booked the day before. Apparently, there was some problem with our reservation (they did not have it at all), but the owner called to another finca, if they have a vacant room for us, and after 5 minutes ride by a jeep, we ended up in a different place where we were going to spend a night. We didn't know any better than to pack our backpacks and leave for the hike in Tatacoa desert. 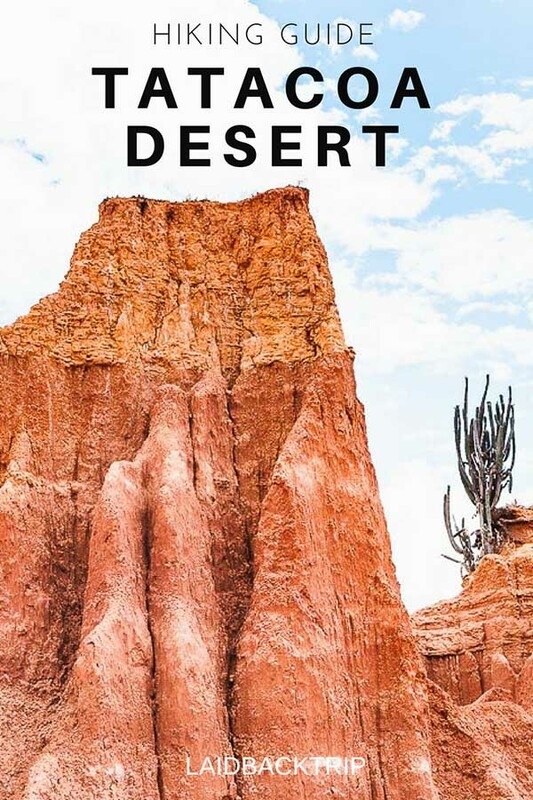 It's not an actual desert, but everyone calls it that way. To make it a little bit more confusing, there are two places, where you can go, red desert (Cuzco), and grey desert (Los Hoyos). The first one is just across the main observatory, and near a place where the most of all accommodations are, the latter is 8 km from the town, and you can take a mototaxi or tuktuk to get there. In this article, I'm going to describe the red desert hike. To enter the trail, you have two options. The first access point is from the Mirador on the opposite side of the road from the Astronomical Observatory, the other entrance is at the back of the La Gauca hotel. There are signs with points of interest along the trail, and the trail itself is well-marked with short wooden logs with yellow tape. The difficulty of the hike mostly depends on the time of the day you will do it. The weather in the desert is hot, it was almost 40°C around the noon when we did the hike, and I still think it was not the smartest idea to start, when the sun was strongest, but on the other side, we met only 5 or 6 other people on the trail, so if you want to avoid the crowds, this might be a good tip. We saw more goats that day than other tourists. Our Travel Tip: The extreme temperatures and the blazing sun are not the only things that you will battle in the desert. There is only an unpaved road, and the traffic creates a lot of dust so bring something to cover your mouth and nose. The best time to start hiking in the desert is around sunrise and sunset though, the heat from the sun is much more bearable and creates a perfect opportunity for taking great pictures. Just make sure, you have enough water, bring a hat, and strong sunscreen. There is no shade along the way, and staying hydrated is very important. It doesn't matter where you start, or which direction you take, it's a nice loop, so you won't miss anything. We entered the trail at the wrong place but found the way quickly. Generally, when this happens to you, just make sure you don't scatter around too much, or damage the formations, just look for markings. Cementerio de Los Fosiles is the furthest you can go, and there is not much to see beyond the point. We were getting tired, and it's a good idea to turn back and carry on to the next point on the trail map. We spent more than 1.5 hours in the desert area, as some formations with the cacti growing on the top of them were remarkably impressive. And that's so great about the desert trail as you can stay and explore as long as you want. It might be a good idea to bring sturdy boots because when it's raining (surprisingly more common than you would think), the trail can get muddy quickly, or if you accidentally step off the trail, the boots will protect your feet against sharp cacti thorns. And also the very hot and dry conditions are the perfect home to snakes, spiders, and scorpions which are not easy to spot though. If you like sunsets as we do, there is a nice rim walk close to the main road, and you can take great pictures from there if it's not too cloudy. Bring a torchlight with you though, on the way back to your accommodation, you are going to need it, as there aren't any street lights along the road. More adventurous travelers can stay in the desert after dark, as this is a great place to watch the stars. The nearest big city Neiva is approximately 40km away, and there is very little air and light pollution and night sky can be extremely clear. Our Travel Tip: Can I walk in the desert on my own? Great question, sure you can, and you don't need a guide. The trail is well marked, and you see the path clearly. It was a bit too cloudy for stargazing when we stayed there, and we felt a kind of disappointed about the night sky after hiking in Los Nevados National Park (read more about our 4 day hike HERE) which featured one of the best night sky views we've ever seen.